This month’s update comes on the heels of a very successful Outer Reef Owners Rendezvous and charity event held in beautiful Charleston Harbor, South Carolina the first week of June, 2013. The weather for move-in day was a bit uninviting and the long range forecast was not too rosy. Although we all plan and hope for good weather, being boaters, we all have learned to go with the flow when it comes to weather patterns. The welcome dinner on Thursday evening was a bit windy, wet and raw, but warm spirits of all our owners as well as some liquid spirits and good food seemed to temper Mother Nature. Unexpectedly, and in contradiction to all weather reports, the front pushed through very rapidly and by late Friday morning, the skies had cleared and the warm sun embraced us all. The days were filled with all sorts of activities such as seminars, a plantation tour, kayaking, owner’s boat tours and a beachside BBQ. 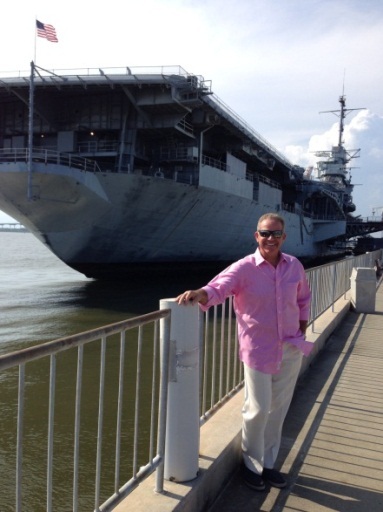 Saturday evening’s dinner was held aboard the USS Yorktown, a WWII aircraft carrier. The USS Yorktown was a very inspirational setting for the evening’s fund raiser for the Wounded Warrior Project, a charity that is very close to my heart. Our goal this year was to raise enough money to purchase two Action TrackChairs, which are all-terrain wheelchairs, and to donate them to the Wounded Warrior Project. At over $15,000.00 each, these amazing chairs enable our wounded warriors to get back into nature, whether it be hunting, fishing or going to the beach with their families. This freedom helps bring a sense of "normality" back into their lives when they most need it. I am happy and extremely proud to announce that thanks to the generosity of our owners and donations from our loyal vendors that we raised well over $40,000.00, meeting our goal to purchase 2 Action TracChairs for our wounded warriors. I want to once again personally thank all of our owners and vendors for their kind generosity in helping change the lives of at least two very special veterans and their families! The freedom we all have that allows us to pursue our family lives and business interests to the point of being able to purchase one of our Yachts would not be possible without the brave men and women or our armed forces fight for that freedom every day. These heroic men and women have paid the ultimate price for our freedom and now it is our turn to give back, and you all have! Thank you so much! Sunday morning was the farewell breakfast, time to say goodbye to all our friends and family and head off to wherever the wind and currents (or airplanes) may take them. Upon personal reflection, I enjoy every Rendezvous more so than the previous, for seeing all our friends continues to deepen the bonds between us. Boats may come and go, but friendships and memories last forever and that is what we are really building here at Outer Reef Yachts.